I’m giving thanks for all of you this weekend with a sale. Use coupon code HOLIDAY2016 to take 20% off any Ready to Ship items in my Etsy shop. Type “Ready to Ship” into the search box under my shop banner, or look through my Ready to Ship sections on the left side of my shop to see items that qualify. Sale ends at midnight on Monday, 11/28. It’s my birthday! Let’s celebrate with a sale! Today is my birthday! Let’s celebrate with a sale! Use coupon code HAPPYBIRTHDAY2015 to take a whopping 40% off of any Ready to Ship items in my Etsy shop. There are over 75 items that qualify. Woo hoo! Sale ends at midnight on Sunday, 6/7. You can see all of my items here. Are you as obsessed with Pinterest as I am? Come find me and let’s connect! Click on the little red “Follow” button in the upper right to follow my pins. See pics of my latest jewelry, plus boards of all kinds of inspiring images in categories like Adorn, Go, Collect, and Dream. And are you on Instagram? Of course you are. I am too. Follow me on IG to see studio shots, process shots, finished work and, of course, cat photos. We all know IG wouldn’t be complete without #catsofinstagram. Happy new year! 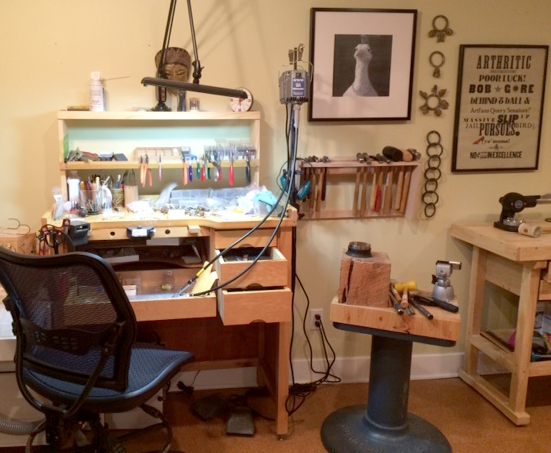 During the dark and rainy winter days in Seattle, I find myself squirreled away at my bench in the corner of my quiet, cozy studio. It’s easy to lose track of time here, focused and buried in some project or another, but as I raise my head to look around, I realize another year has come and gone. Reduce, Reuse and Recycle all the crap we have laying around on our benches and in our studios! Finish all those projects, use those stones we’ve been hoarding, take a look at that old sketchbook. Nothing is off limits here. Make as much work or as little as you choose but you need to Use What You Have. Fun! The old notion that jewelers are hoarders is true for most of us – we love to collect stones, we save bits of old, broken projects, cut offs from scrapped jewelry, and lots and lots of “what ifs” and “ooh, shiny things!” Many of us end up with drawers and boxes full of things we’ve been collecting for years. Wouldn’t it be great to use that stuff up? So that’s what I and a small group of jewelers set out to do this year. You can see the results of our efforts here in our 3xR Flickr group. 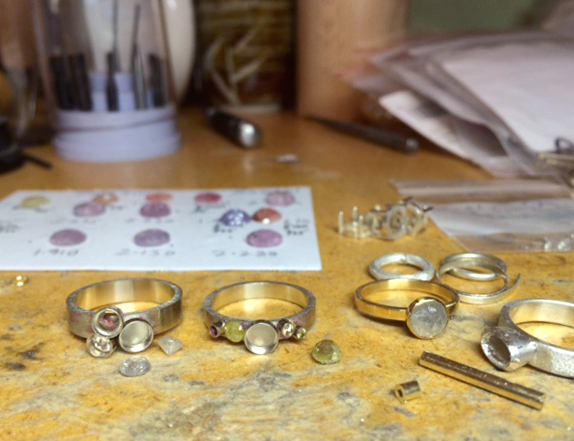 My goal was to finish one project per week, and though I occasionally lagged behind, I did, really, truly finish 52 projects – totaling more than 80 individual pieces of jewelry – by the end of the year. I cleared out my “To Do” pile, sifted through my “Maybe?” pile, and ruthlessly culled my “WTF” pile. It was decluttering at its finest, cleansing, renewing and continually motivating. On days when I felt tired and uninspired and had to drag myself into the studio, I could just poke through the small piles of projects awaiting my attention on my layout table and see what spoke to me. Most of my projects were simple, and a few were more involved, but the goal was not necessarily to challenge myself with technique, it was to literally clear my bench. I posted all 52 of my projects in the 3xR Flickr group as I went along. 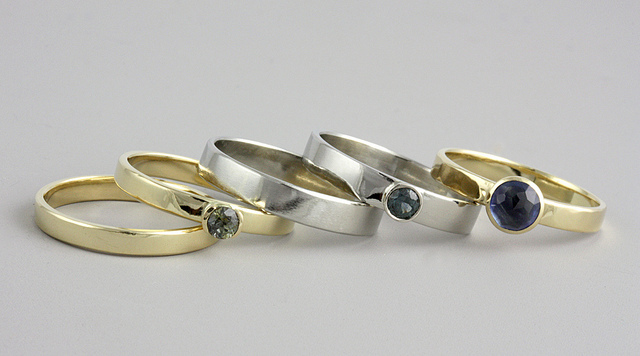 I started with a bang by completing five gold and sapphire rings that I had had sitting half-finished on my bench for about a year (photo below). And moved on from there. You can see listings for many of the pieces here in my Etsy shop. Check out photos of all of my 52 weeks below. WHEW!!!! That was a lot of photos! And a lot of work. Looking back on all the pieces, I can remember the satisfaction I felt at getting each and every one of them finished, photographed and listed online. The best part? My layout tables and benches looked clean for a bit – at least, until I covered them again with To Do projects yet to come. I think I’ll keep up the challenge in 2015. Stay tuned for updates along the way. I wish all of you the best in this year’s challenges of your own, both planned and unexpected. May we all be able to clean our own spaces, both physical and mental, from time to time to make way for new work, new inspiration and the clarity that can only come from a thorough and clean sweep. 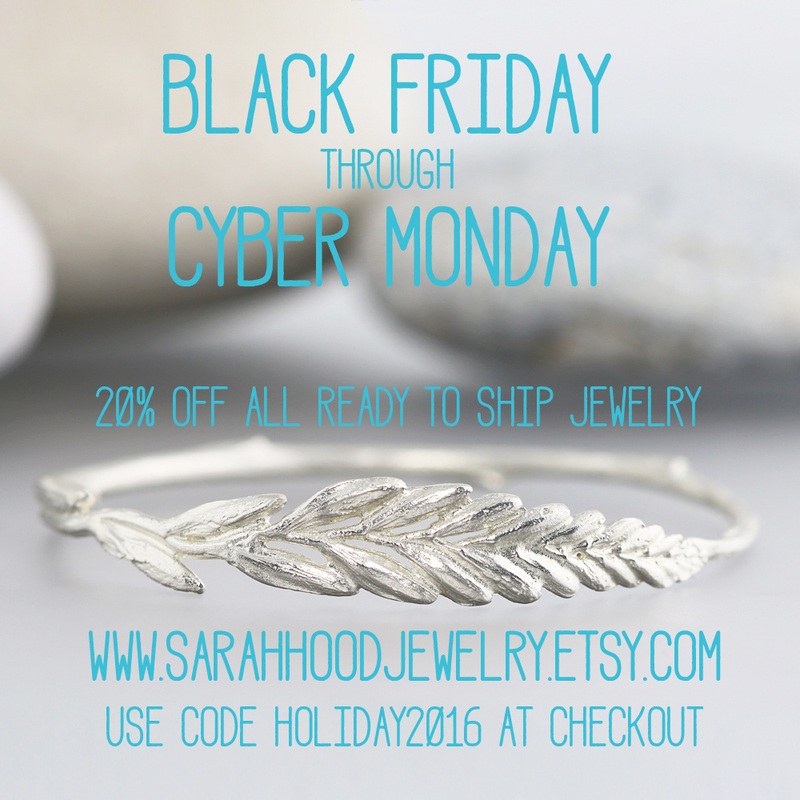 Black Friday / Small Business Saturday / Cyber Monday SALE! I’m thankful for so many things this holiday season, not least of all the support of my friends and fans including you. 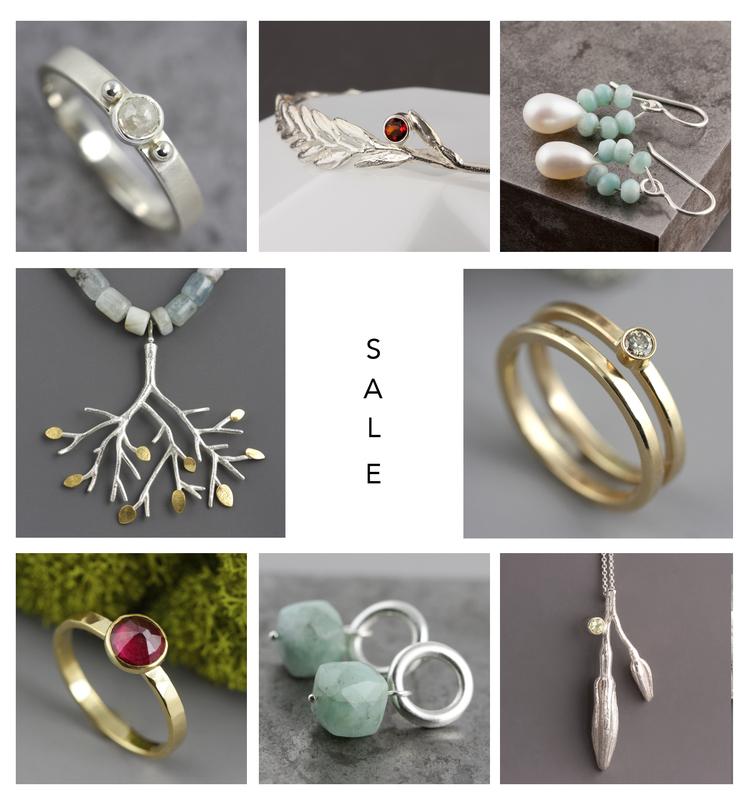 To celebrate the season, I’m having a sale! Now through the end of Monday, 12/1, take 15% off of all Ready to Ship items in my Etsy shop. The best part? Because it’s all ready to ship, the jewelry will be in your hands by the end of the week. Gift shopping doesn’t get any easier. Use code EtsyMetalSale when checking out to automatically receive 15% off. Thanks again, friends, and hope to see you in my shop soon. I’ve gotten some love from Etsy lately! And my Rose Cut Sapphire Ring (see photo below) was included in Etsy’s “Our Favorite Etsy Engagement Rings” post in the Diamond Alternatives section. Sweet! 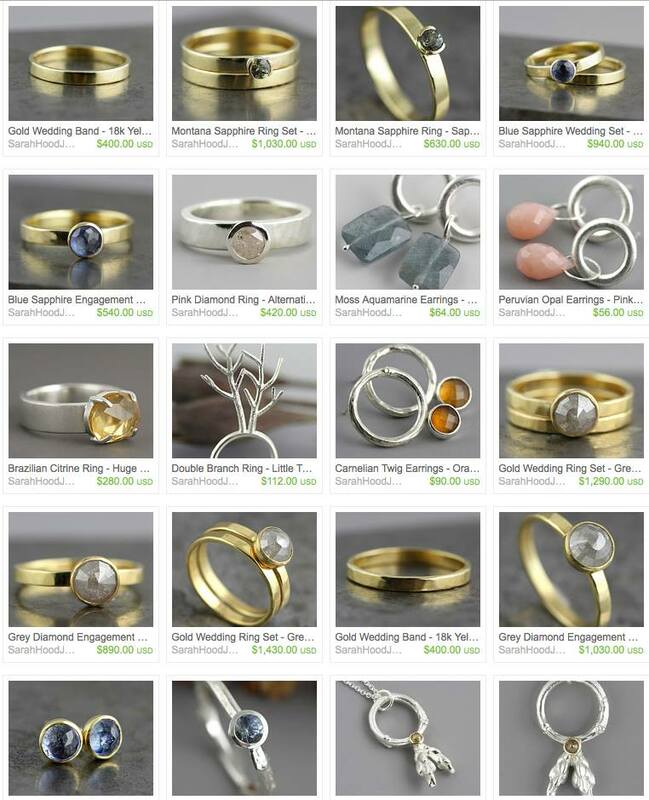 See more engagement rings, both Made to Order and Ready to Ship, in my Etsy shop. It’s my birthday today and I’m having a flash sale in my Etsy shop to celebrate. Use coupon code HAPPYBIRTHDAY2014 to take 20% off of any Ready to Ship item in my Etsy shop. 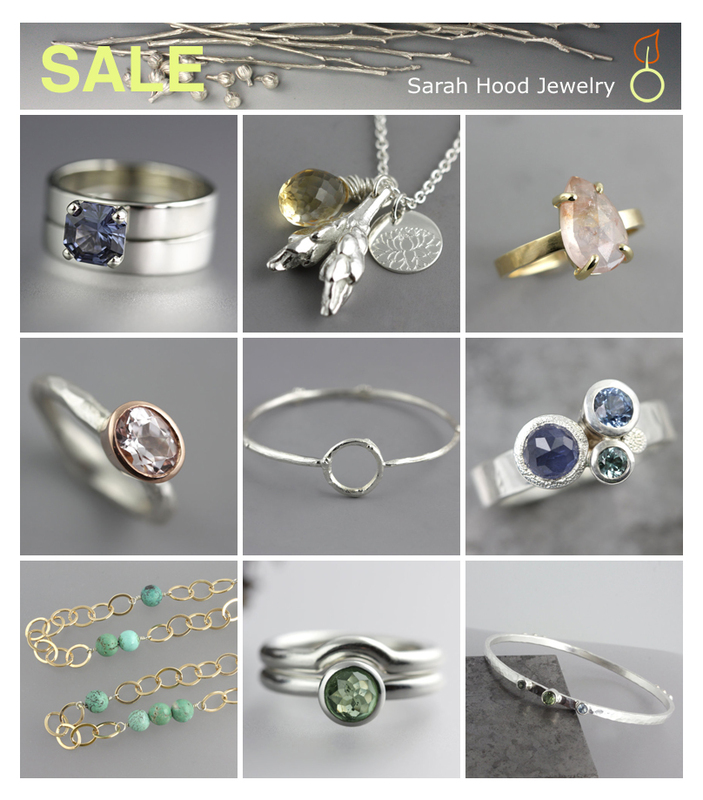 Sale ends midnight on Tuesday 6/3 (that’s tomorrow! ).